St. Joseph of Arimathea Chapel is the heart of student life and worship during the Residential Summer Sessions. The two-week Residential Summer sessions allow postulants to experience collegiate life through community and daily worship in the chapel. The College's campus is composed of the chapel, offices, classrooms, library, housing, and common dining. 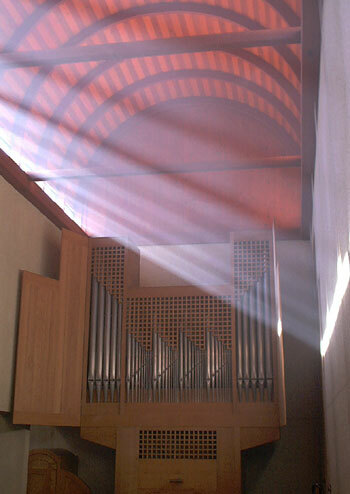 The Chapel also serves a local parish, comprised of university students and Berkeley area residents (see http://sjachapel.org) with weekly Sunday celebration of the Holy Eucharist. All are welcome. We believe that the Divine Liturgy is where time and eternity meet. The weekly cycle of the Daily Offices (Morning and Evening Prayer), highlighted by daily celebration of the Holy Eucharist, is the heart of priestly formation. In the Chapel, vocations are tested, the religious experience is deepened, and the discipline of prayer is observed. The College maintains that theology cannot be understood through lectures and literature alone. Understanding is reached through immersion in the Liturgy and worship, as well as formal study, deepening and enriching an understanding of the Christian tradition. The Liturgy of the Church does not exist as an end in itself, but through the observance of classical Anglican Liturgy, postulants are deeply nourished by the Word of God spoken in the Scriptural readings of the Daily Office and the Holy Eucharist. We believe that the Liturgy of the Church is our participation in the Heavenly Liturgy offered by Christ. The Chapel is a barrel-vaulted collegial church (that is, a church with a quire and sanctuary, without the nave common in a parish church), fifty feet long, less than twenty feet wide in its main body, and thirty feet high. Its verticality gives to the chapel the feeling of a church of the Early Christian epoch; the sensation is further heightened by soft lighting provided by a row of high clerestory windows on each side of the main body and skylights over the north-eastern transept and the south-western aisle. The bema, or tribune, and its altar dominate the chapel. The Chapel Organ - a twelve-stop, two manual and pedal, mechanical-action instrument - was built by Herr Jurgen Ahrend of Loga-Leer, Germany. Herr Ahrend has become one of the most renowned organ builders in the world by virtue of his work both in Europe and America. The organ is tuned to the just temperament dictated by the late seventeenth-century German master, Andreas Werckmeister. To the untrained ear the difference between this and the equal temperament, which today is hardly noticeable, but by virtue of the traditional tuning, the instrument is especially suitable for hearing the range of great liturgical music of the medieval and early modern periods as it was heard then.